St. Albinus was born in 470, to a noble Roman family, at Vannes, Brittany. 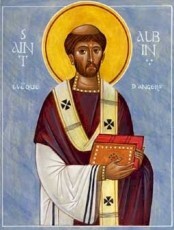 St. Albinus was a French Abbot, and was elected to serve as Bishop of Angers, France. He campaigned against incestuous weddings, especially those that occurred between members of the nobility, to protect their namesake. He participated in the Council of Orleans in 538, after King Childebert granted permission for the council to take place. He sought advice from St. Caesarius of Arles after seeing laxity in other Bishops. Tradition states that he helped all in distress using Diocesan Funds to free hostages from Pirates. Another time, he clashed with King Childebert, who had imprisoned a woman called Etherie, from Douille near Angers. Unable to secure her release by reason, he visited her in prison. The soldier who tried to resist him fell dead at his feet. This so impressed the King that he allowed St. Albinus to bail her out. Another example is that St. Albinus once prayed far into the night for some men imprisoned in the Tower of Angers. Suddenly a great stone collapsed from the wall, allowing all of them to escape. St. Albinus died in 550, and was buried in the Church of Saint Pierre at Angers. In 556, a Church was dedicated to him and his body was buried in its crypt. Near this very Church, an Abbey arose. Many Churches across the continent were dedicated to him, as far away as Poland. St. Albinus was born to a noble Roman family, and went on to serve the Church. He was a French Abbot and was elected Bishop of Angers, France. He stood up to the societal problems of his time, and worked diligently to promote the faith, especially to those in distress. It is said that while he tried to visit a woman that was falsely imprisoned, the guard that tried to stop him, dropped dead at St. Albinus feet. Many times, miracles would happen around him, to assist those in distress. These miracles continue for those that venerate St. Albinus or visit his gravesite.